Heat oil in a large frying pan over high heat. Add garlic; cook for 30 seconds or until fragrant. Add beef; cook, stirring to break up lumps, for 5 minutes or until browned. Add pasta sauce; bring to a simmer. Stir in basil. Meanwhile, cook gnocchi in a saucepan of boiling salted water for 2 minutes or until gnocchi rise to the surface. Drain. Add to beef mixture; stir to combine. Preheat an oven-grill to high. 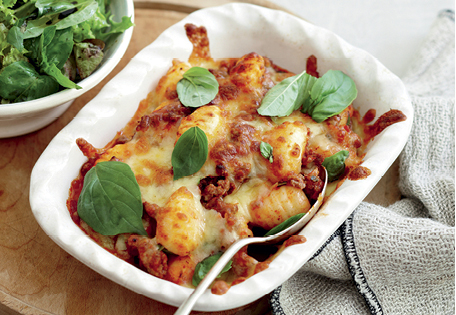 Spoon gnocchi mixture into 4 x 2-cup ovenproof dishes. Sprinkle with cheese. Grill for 2 minutes or until bubbling. Sprinkle with extra basil. Serve with salad.